The Christian Palette, Issue # 18 Check your Vision! Whatever your many reasons, each of you have subscribed in the hope that what you read here may help you on your journey as artists. That is what motivates me to keep this ezine going. As artists, I know that you are hungry for information about materials, techniques, tips for creativity…. I usually am. There is plenty of information on the internet about the use of art supplies, tips and techniques for different media… I may touch on some of those here in future issues. However, each time I prepare for a new issue, I sense that the Lord is most interested in our spiritual growth; change in the deepest part of who we are. Surrender and conformity to His nature and image are His primary objectives for each of us. Those changes are accomplished within us over time, as we walk in obedience. He will then surely anoint us with the grace required for us to become better artists. It may seem backwards, but isn’t that how His kingdom operates? The laws of this precious Kingdom of God seem “upside down” (while they really are “right side up”) and feel completely contrary what comes naturally to us. It is with that awareness that I ask, “Have you checked your vision lately?” No, not your eyesight, but your vision. As artists, we rely heavily on our vision. What we “see” is what we strive to translate into our media of choice. So is it possible that there is a right and wrong way of seeing? While studying Lot and Abraham, I was struck by the contrast in their vision. Trouble began when they could no longer dwell together without strife. Abraham, recognizing that strife was deadly, asked Lot to choose his land, his future and therefore, his destiny. Lot’s assessment of what his future could become was based solely on what he saw with his eyes. He seemed completely oblivious to God’s opinion on the matter. The well watered land beckoned with the promise of abundance. Little did he know that one day his eyes would witness it becoming a desolate wasteland! His choice also reflects his inherent selfishness. He chose the best for himself. Lot's choice should have put Abraham at a serious disadvantage, since he was left with land that looked far less desirable! However, it made no difference to Abraham because he was profoundly aware of God’s role in his destiny. 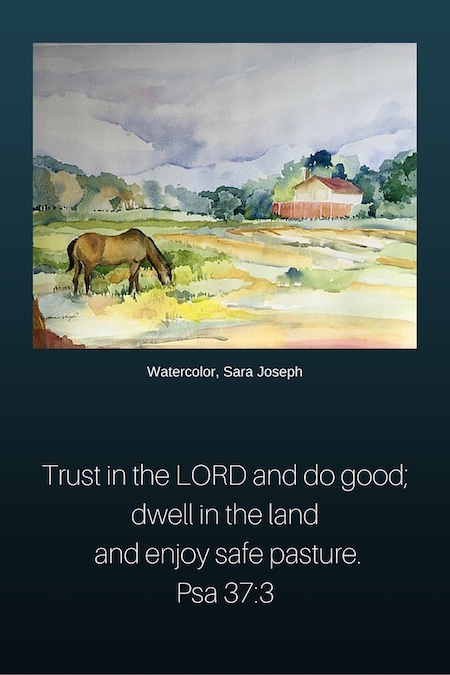 His humility in permitting Lot to head off to where his “eyes” led, demonstrated faith in an unseen future with God that would be abundant for the needs of his own family and flocks. What happens next is remarkable! God then “lifted up” Abraham’s eyes! There were stunning repercussions to Lot’s choice, moving as he did into Sodom. There were also profound ramifications of Abraham’s dependence upon God. So I urge you to check your vision as your serve God with your creativity and art. Will you “lift up your eyes, see and choose” for yourself, or will you wait for God to “lift up your eyes” to “look from the place where you are” to enjoy a destiny that is of His choosing? Something to think about very carefully, isn't it?